I am that person who drinks hot coffee when it’s 95 degrees and humid. Similarly, I like a bowl of something warm over cold for breakfast all year round. 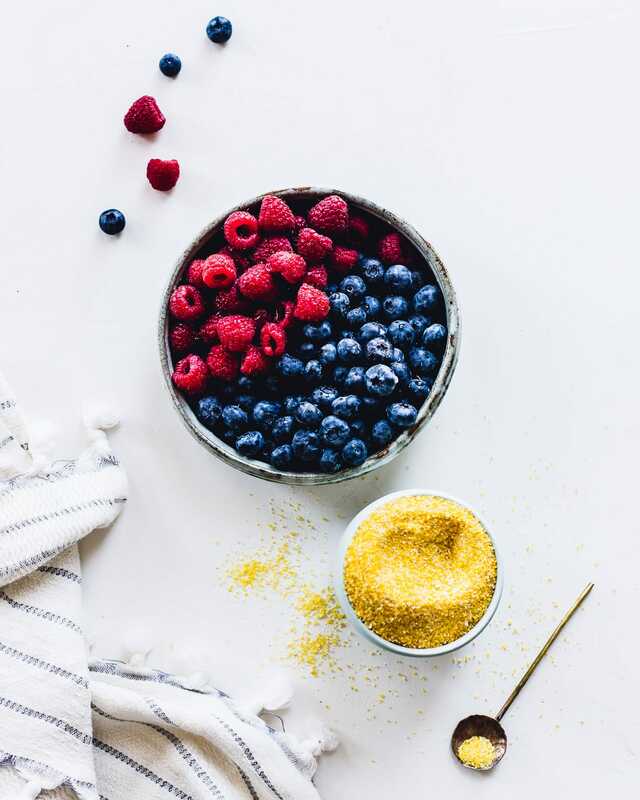 Chia pudding and overnight oats….. you haven’t won me over yet. That being said, I’ve been experimenting with different grains and ingredients to make porridge, because as much as I love oatmeal, it can get a bit monotonous. 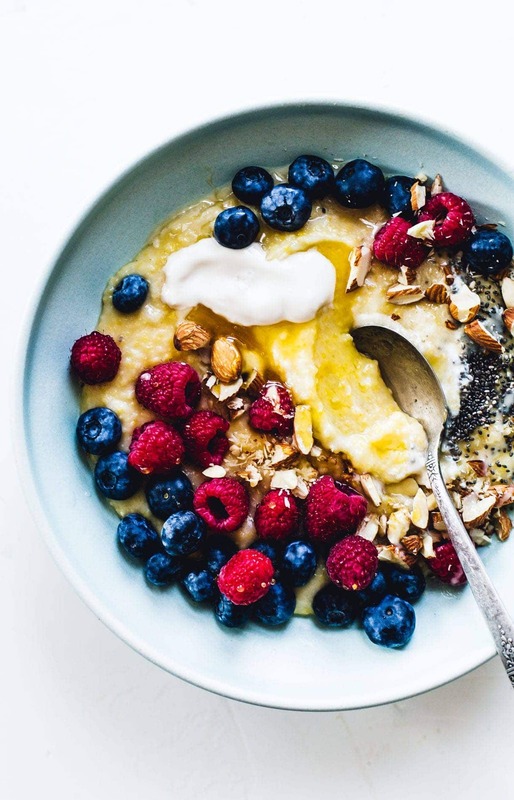 Sweet or savory, polenta porridge is a winner. 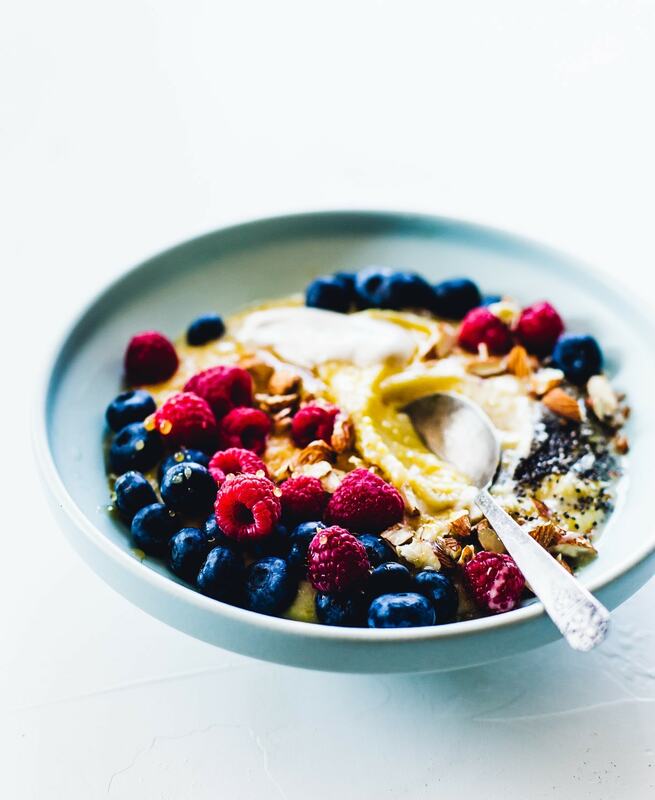 So today I’m sharing this creamy yogurt version of breakfast grits, with sweet berries and honey. For my dairy-free friends, I used Silk’s new Almond Yogurt, which worked wonderful in this recipe. 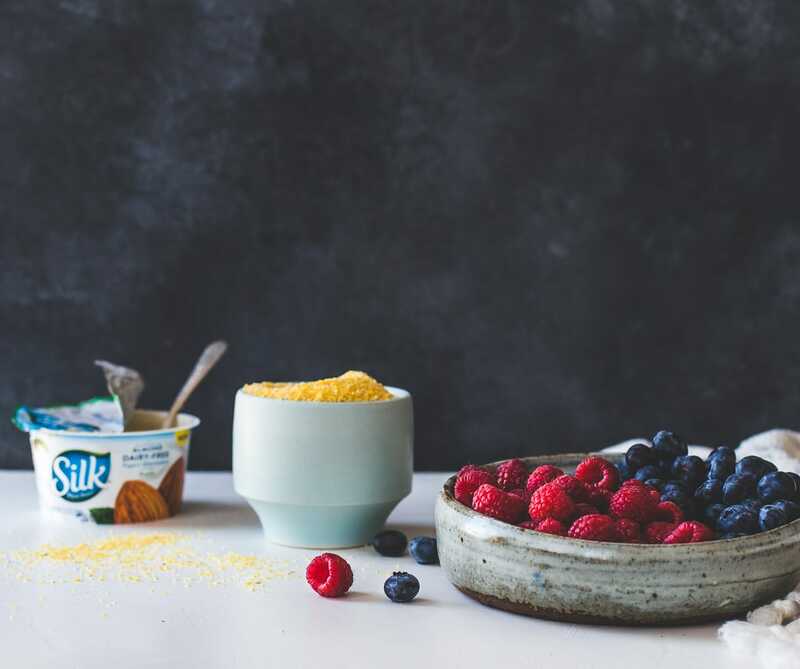 And as far as non-dairy yogurt’s go, it has a really clean, short list of ingredients. No gums or strange stabilizers, unlike this popular one which is made with 2 gums. I wasn’t introduced to polenta until my early twenties, and in case you aren’t familiar, it’s simply ground cornmeal. You can buy it according to how it’s been milled, from fine (that cooks very quickly like instant oatmeal), to coarse stoneground (that takes closer to 30 minutes like steel cut oats). When boiled with water, broth, or milk, the cornmeal softens into a creamy, warm, comforting bowl of good. I prefer coarse, stoneground polenta for its fuller, richer corn taste despite it’s longer cooking time. It also retains more texture, and nutrients, as you’ll likely see black/brown specks of the hull. If you’re more of the “quick in the kitchen” type, you could use instant polenta, just be careful not to overcook as it will become a little pasty. 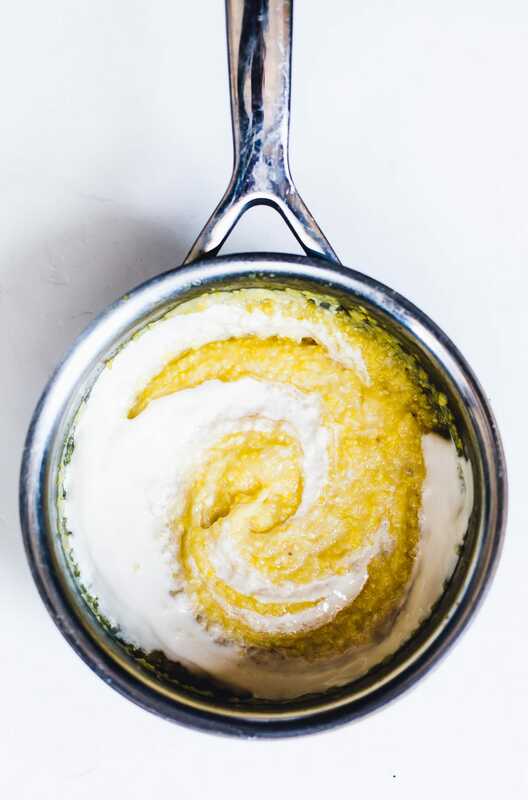 Most often butter and cream is stirred into polenta, but here, yogurt takes its place beautifully. Thick, velvety, and naturally a little sweet because it’s corn. I added a bountiful amount of toppings, including blueberries, raspberries, and honey. Almonds for crunch, and chia seeds for an extra fat boost. As with many of my recipes, I encourage you to make this porridge your own, what you have on hand, or what you’re feeling privy to. I had a made craving for berries, in March, and I didn’t let that stop me. A girl wants what she wants sometimes. Bring the water to a boil. Stir in the salt, then slowly whisk in the polenta. Stir and stir and stir all the while, so no clumps form. Add 1½ tablespoons honey. Reduce the heat so that it is just barely simmering - as in just a few pips sputtering out from the top. Simmer for at least 30-35 minutes, stirring occasionally. You may be tempted to thick it's done earlier, but the corn takes awhile for it to rehydrate itself fully. The polenta will begin pulling away from the sides as you stir, and then you know it is done. It should be creamy and still a little loose, thick enough to coat a spoon. Remove from heat and whisk in ¾ of the yogurt cup. 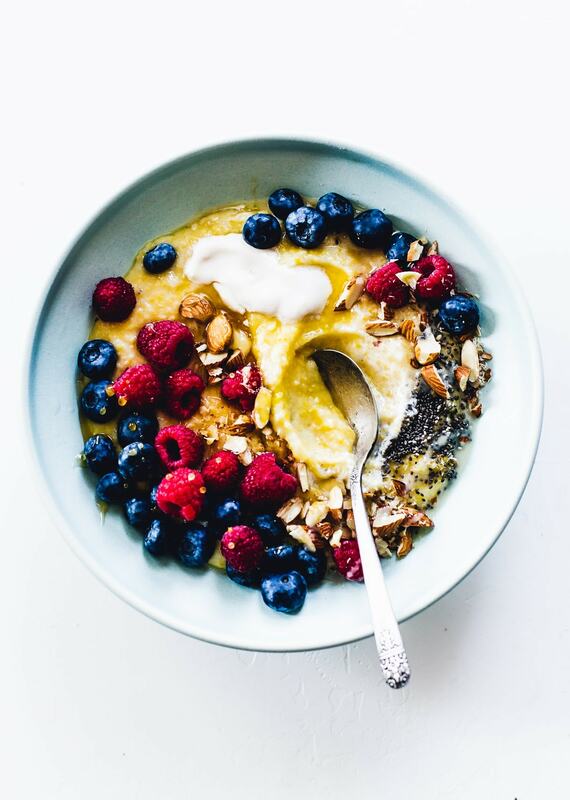 Then pour into bowls, and top with remaining honey, berries, almonds, and chia seeds. Mmmm! Sounds incredible and looks even better! Thanks for stopping by Tori! Hi, this looks delicious, here in Portugal it’s normal do polenta with meat or seafood inside. I’m going to try this one . Thanks. i love savory polenta too. something so comforting, which is why i wanted to try it with some sweet notes. hope you enjoy! Using yogurt in this is such a brilliant idea. it sounds so reach and creamy. Also your styling and photography is so on point! sounds amazing! I’ve just got onto porridge (having previously been an overnight oats girl) and have started playing around with different grains – fave so far is a mix of steel cut oats and whole oats, and sometimes buckwheat. 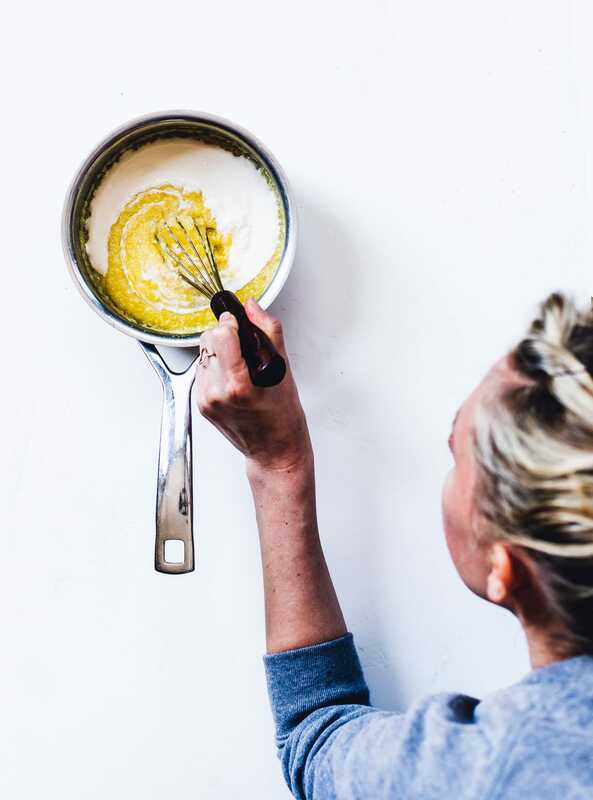 Wouldn’t have thought of polenta though – must try it soon!